"Dark Side of the Full Moon" will be shown at Deepwater Theater on March 28th. Ocracoke resident Lauren Strohl is hosting the screening because she hopes to raise awareness about the film's content: an exploration of maternal mental health disorders, a.k.a. post-partum depression. I asked Lauren why this particular topic interested and concerned her, and she told me that she has a personal connection because of a family member who experienced depression after having a baby. "I'm aware of post-partum depression because I watched her struggle and recover," Lauren said. "I want the documentary to speak for itself, and by showing it I want to be a proponent of women's health – it seems very relevant to me for everyone to be aware of it." Maternal mental health affects everyone in the family. The old saying, "when mama ain't happy, ain't nobody happy" takes a dark turn when mama's unhappiness is caused by real depression and anxiety, even psychosis. Most women with post-partum depression suffer in silence, although, according to the film, there are 1.3 million mothers affected each year. "It's not talked about, it's not a part of women's health that is discussed," Lauren said. "We only hear about it in breaking news stories when it's at its extremes. There needs to be a change in the way we perceive maternal mental health and the way we handle it – medically and culturally." Lauren gave shout-out to Chapel Hill for having the only post-partum clinic in the country. 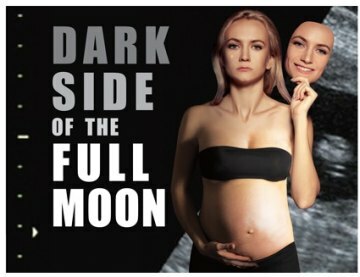 The Center for Women's Mood Disorders at the UNC School of Medicine has outpatient and inpatient services, and is featured in "Dark Side of the Full Moon." Health care workers are learning how to screen and treat these moms effectively. All are welcome to the viewing of "Dark Side of the Full Moon" on Saturday, March 28th at 7pm at Deepwater Theater. The film comes with a trigger warning for those who may be suffering or recovering from a maternal mental health disorder, so viewer discretion is advised. Seating is limited to 30 people due to copyright rules, so please reserve your space by calling Lauren at 614-419-9681.